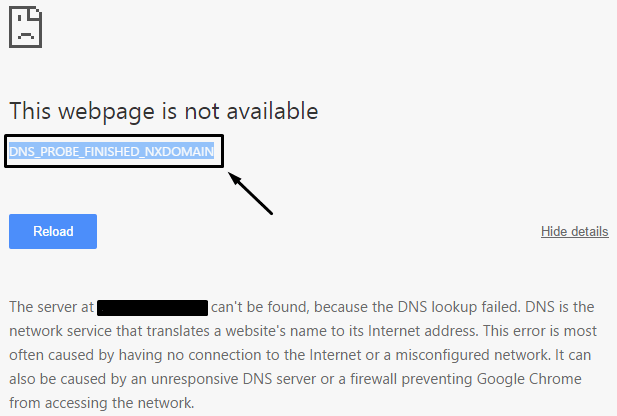 The error dns_probe_finished_nxdomain is a browser error that generally occurs in Chrome Browser. This dns_probe_finished_nxdomain is actually a technical demonstration, and it does mean that the webpage cannot be opened. This error may appear due to lots of errors such as the wrong configuration on your PC or WiFi Router; it may also happen when the web page that we are trying to open is down due to some internal error. Computer firewall settings can also generate this problem. Whenever the user tries to access a website, the browser will resolve the IP address of the equivalent website with the help of Domain Name System (DNS). In this case, when browser gets unable to reach that DNS server or resolve the IP address then this error occurs. It is clear that this error occurs because of the DNS, so it is recommended to Flush the DNS of the computer. Apply the below-given steps carefully in order to flush the Windows DNS. Step 1: Open Run Window, press Windows Key + R to open up the Run dialogue box. Step 2: Type CMD in the run dialogue box, it will open up the Command Prompt Window. Step 3: In the command prompt, type the below-given command as it is and hit enter key. Step 4: After executing above given command now you need to restart the Windows. Try to open the same web page, it is hoped that the issue must be solved. By restarting the DNS client from Services will also become helpful in fixing dns_probe_finished_nxdomain error. Open the run dialogue box by pressing Windows Key + R, in the dialogue box type services.msc and press enter key. This command will open up the Services window. 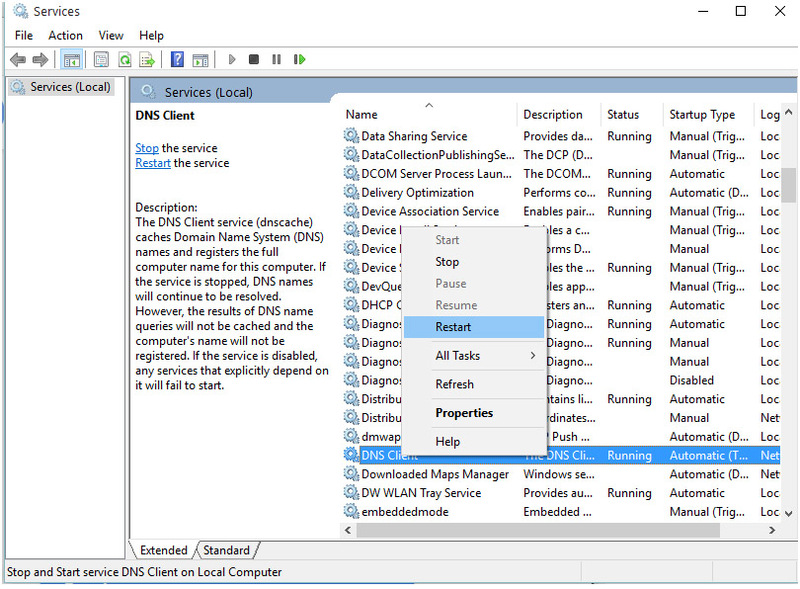 From the list of Services, find DNS client and right click on it and choose “Restart” to restart the “DNS client”. After completion of this process try to open the Google Chrome and access the web page that was giving the error. Step 1: Go to the Network and Sharing Center section and click on the Change adapter settings present on the left pane. Step 2: After it double-click or right-click on your current active internet connection and choose Properties button. 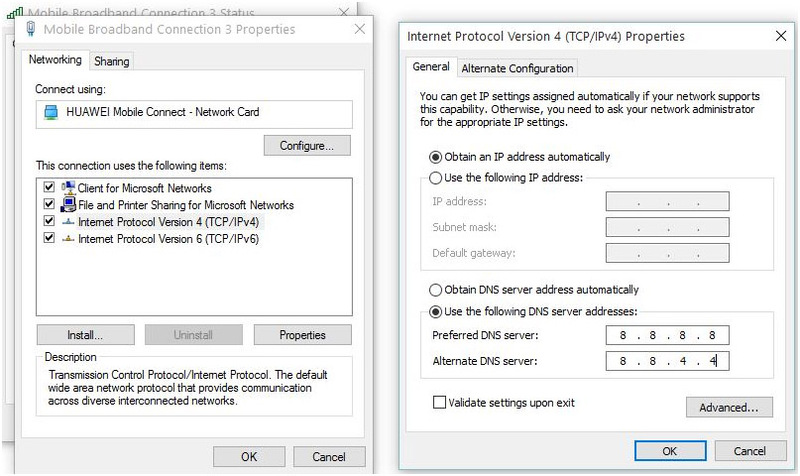 Step 3: Double-Click on the Internet Protocol Version 4 (TCP /IPv4) to bring up the properties window. Step 4: After it, select Use the following DNS server address option present at the bottom of the Internet Protocol Version 4 window. Below Google’s public DNS server address is given. Step 5: Click on the Ok to save the settings. Close the Control Panel. At last, restart your PC, and open Google Chrome browser to access the webpage. It is hoped that the dns_probe_finished_nxdomain error should not occur again. Sometimes due to the outdated or damaged cache, this kind of error may appear. In order to overcome from this situation, you need to delete the cache and create a new IP Address. After executing these commands, reboot your computer and then see if the DNS_PROBE_FINISHED_NXDOMAIN still appearing on Google Chrome or not. This command will take a few times to complete, at last reboot the computer. Step 1: Open the Google Chrome and then type chrome://flags/ in the address bar and then press the Enter key. Step 3: At last, restart Google Chrome. Step 6: Replace or add new Google IP address to the list. Type: 8.8.8.8 and 8.8.4.4. Step 7: After it, press apply and then OK. Step 1: Open the Finder and then navigate to the Applications > Utilities > Terminal. Step 3: After running it, reboot the computer. Step 3: Go with the advanced options and then mark the “Show advanced options” box. Step 5: Now, you have to type in DNS servers IP addresses to “DNS 1” and “DNS 2” sections. Step 6: At last, click on the “Save” and then reconnect to the network. This will activate the settings. If you are using the Android device having the option to remove the battery then you have to disable your device. Remove the battery and then wait for 30 seconds. After 30 seconds, connect the battery back and check for the DNS_PROBE_FINISHED_NXDOMAIN error. Step 3: Then, click on the DNS option present in the left menu. Step 4: Now, you have to find out the Clear host cache option and click it. Step 5: Again, click on the black arrow present at the right top corner of the display. Step 6: A pop-up windows will appear, click on the Clear Cache and Flush Sockets options. Step 7: At last, reboot Google Chrome. This scans your PC and fixes all the bugs or errors present inside your computer/laptop. You can also fix any types of system driver issues with the help of this software; it provides the facility to debug driver related problems. Now you don’t need to suffer from your sluggish system because its advanced technology can turn an old system into a brand new computer. Try it once and improve the performance of your old computer. [Solved] How to Fix the OneDrive Script Error on Windows 10? [Solved] The Unmountable Boot Volume Error in Windows 10?